Someone created a VM for me recently and everyime I launched IE to get to our SharePoint site internally I was being prompted to login. So I changed the IE Setting to use my credentials to log in automatically. That was OK for the time I was on the VM. BUT, when I went back in it asked me again and my settings in IE had been reverted. You write some LINQ code to update your SQL tables like this below BUT it does not throw an exception and it does not Update the tables! The reason why is because your Table does not have a Primary Key! You can update your DBML designer to have that Primary Key and you don't need to touch the actual SQL Server tables for this to work! Error: TF400018: The local version table for the local workspace MY-PC;My User could not be opened. The workspace version table contains an unknown schema version. Click the box in "Workspace". Re-connect to TFS open "Source Control"
So I just wasted 2 1/2 hours tring to figure out the WHY the Tab ordering was not working on my Form (C# project Visual Studio 2010). No matter what I did the order DID NOT CHANGE. There are all kinds of controls like Groupboxes, Panels with Controls inside Controls. No big deal. The View -> Tab Order feature made NO DIFFERENCE at all!! Solving: Cannot open SPTimerV4 service on computer '.'. An error has occurred while validating the configuration settings. An exception of type System.InvalidOperationException was thrown. Additional exception information: Cannot open SPTimerV4 service on computer '.'. One of our Clients were experiencing an issue while Opening one of the SharePoint 2010 Lists in Access. They were essentially Clicking on one of the links “Open in Access” from List’s Ribbon that would result in the following error. “Export to database failed. To export a list, you must have a Microsoft SharePoint Foundation-compatible application.” To resolve this Download and Install the below hotfix for 32-bit Office and then restart your computer. Updates are currently disallowed on GET requests. To allow updates on a GET, set the ‘AllowUnsafeUpdates’ property on SPWeb. · “Updates are currently disallowed on GET requests. · To allow updates on a GET, set the ‘AllowUnsafeUpdates’ property on SPWeb. 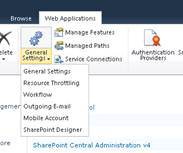 · Troubleshoot issues with Microsoft SharePoint Foundation. that don’t already have them. The call to the HttpThrottleSettings ensures they exist and Update() saves them. After completing these commands, you should be able to successfully launch the General Settings dialog window.